I was asked recently to review a new cookbook based on a US television show called “The Chew”, a cooking/talk show featuring Mario Batali, Carla Hall, Clinton Kelly, Daphne Oz, and Michael Symon. I warned the PR representative that I live in the UK now and have never seen the show, but that I’d be happy to review the cookbook on its own merits. He sent me a copy (disclaimer: for free) and I went through it with my family to pick some recipes we’d all like to try. I thought at first it must be an error, but this broken-ingredient-list layout occurs on several pages in the book. They’ve made a design choice to break up ingredient lists across pages. I spent a good long time going through our massive library of other cookbooks to see if I could find any other example of a cookbook splitting ingredient lists like this, and I couldn’t. Most recipe books list ingredients first – even if the list has to span into another column – and then the methodology. Most clearly take pains to not split recipes at all, or if they must, do it in a way that at least never splits the ingredient list. Most do not even use columns because of the potential for confusing layout, and the one I found that did use columns had hardly any that went over a page and even when that happened, they split the instructions over to the next page, not the ingredient list. 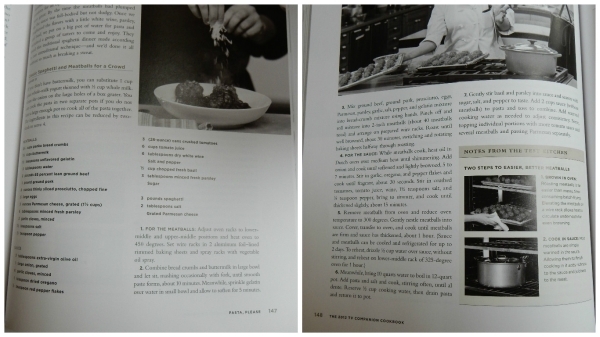 This recipe in the 2012 America’s Test Kitchen TV Companion Cookbook – thus a fair comparison to this other TV-show inspired cookbook – clearly puts all of the ingredients together as one continuous list even though the instructions go on to the next page. Cookbooks stick with this all-ingredients-together layout for a reason: it’s very frustrating to home cooks (particularly beginners) to think they have everything, start cooking, and then realize the next page has several other items that they may have forgotten to buy. Should everyone read recipes thoroughly before starting? Yes. I did, which is why I caught this problem at the shopping stage. Do all cooks do that? Nope. And for a book that has clearly been designed to be attractive with full-colour photo spreads and large photos of food, it’s very disappointing that this basic level of functionality was sacrificed. But okay, fine, that’s just layout. What about the actual recipe? “deep cast-iron skillet” so I used our 12″ Lodge cast iron skillet. 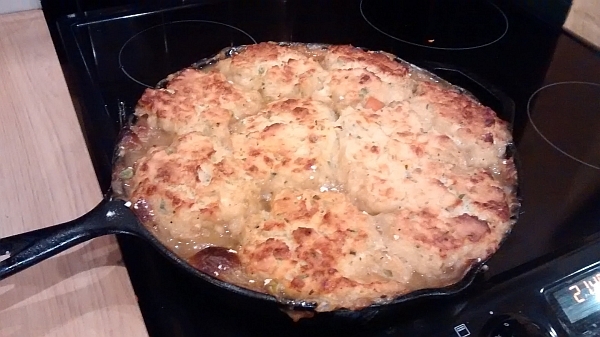 I looked at the amount of liquid in the recipe and thought, “Should I be using the cast iron Dutch oven instead?” because I was worried that 6 cups of stock might not fit in the 12″ skillet, but decided that if I used the Dutch oven, the biscuits might not brown properly by being too enclosed. Plus, the directions clearly said “skillet” and if a standard Lodge pan isn’t right, I don’t even know what is. I mean this is the pan Alton Brown recommended on Good Eats all those years ago for frying chicken, and his book Gear For Your Kitchen cites a 12-inch cast-iron skillet as his primary use pan. Other recipes in the book do specify pan sizes, so I assumed the 12″ must be good enough since we also have a 10.25″ which most cast-iron users would consider to be a smaller pan. I think it’s fair to say that a 12″ Lodge is going to be what most US-based home cooks reach for if told to use a “deep cast-iron skillet” with no other measurements listed. But no, it wasn’t big enough. As I added the ingredients, I could tell this was going to go badly. At the simmering stage instead of going for 10 minutes, I went for more like half an hour to reduce the liquid down. This was clearly not going to accommodate the biscuits, and this was after 20 extra minutes of reducing. You can see by the time on the clock that dinner is going much later than expected at this point for a household with kids! The overflowing pan in the oven as the biscuits expanded. Those white dots aren’t just because I took this photo with my cellphone…they’re bits of unmixed, uncooked flour. Some of the flour under the biscuits gelled up into a gooey paste, but other bits just hung around, unincorporated in any way. A serving of this dish, showing the bits of flour. Okay, so the layout for this recipe was bad, the instructions weren’t specific enough for the pan size, and there was weirdness with the dredging part. But how did it taste in the end? 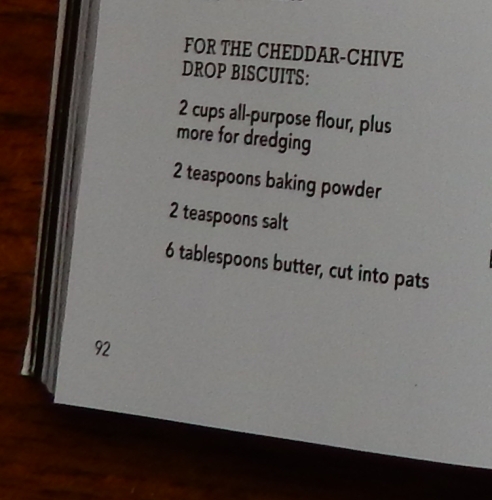 The cheddar-chive biscuits actually were quite nice, and everyone in my family liked them. But the potpie portion itself was uninspiring, and actually unpleasant when reheated as leftovers. 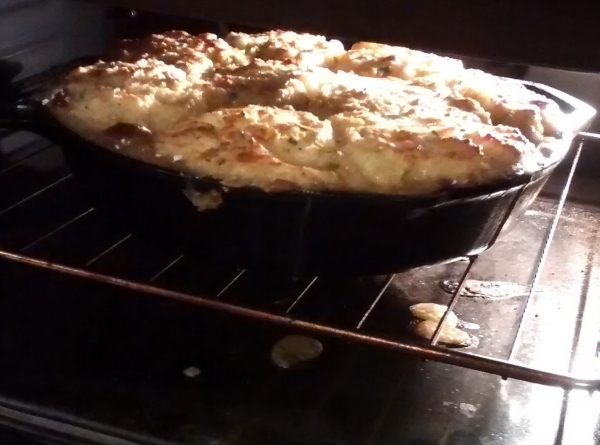 I’ve made many chicken pot pies of various types over the years and this – while edible – was the least liked by everyone. We all agreed that the cheapest grocery-store-brand frozen pot pies have better filling than this. The leftovers didn’t even get finished and ended up being tossed out, which is unusual in our house. However, we all agreed that the cheddar-chive biscuits should be used for other recipe toppings in the future, or as stand-alone biscuits. We all also agreed that the dredging accomplished nothing other than leaving balls of uncooked flour around, and should be skipped. 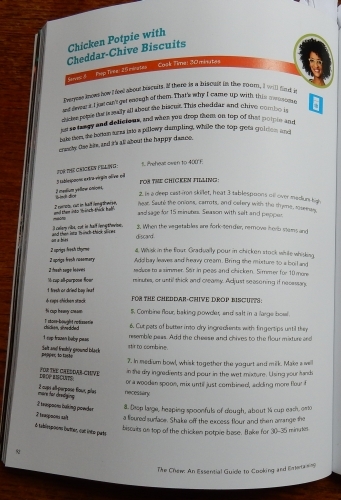 An improved version of the recipe that appears in the cookbook The Chew. 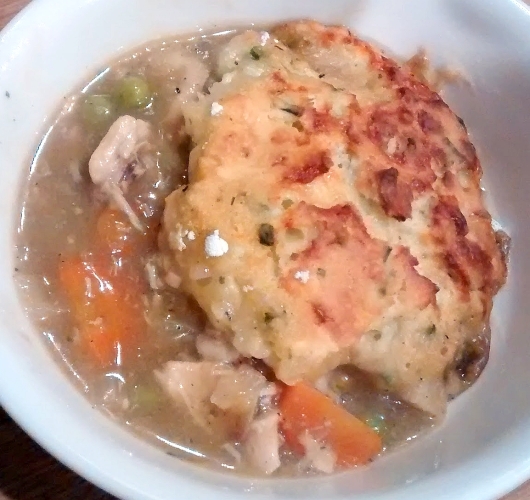 Originally on top of a chicken potpie, they could instead be put on any stew-type casserole or baked as a stand alone. Cut pats of butter into dry ingredients with fingertips until they resemble peas. Add the cheese and chives to the flour mixture and stir to combine. In a medium bowl, whisk together the yogurt and milk. Make a well in the dry ingredients and pour in the wet mixture. Using your hands or a wooden spoon, mix until just combined, adding more flour if necessary. Drop by heaping spoonfuls on top of a stew or pot pie liquid base and cook as per the directions of that base (original recipe said 30-35 minutes) or bake on their own until golden brown (about 10-15 minutes depending on size). 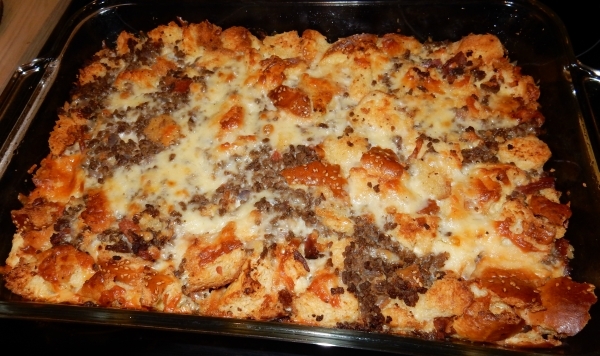 After all of that, I was honestly reluctant to try another recipe from the book, but I couldn’t resist “Burger Bread Pudding” because that just sounded delicious. And happily, it was! This was very tasty, even as leftovers. This recipe specifies the pan size (although I used a larger one because I didn’t have the specified size and was worried after my last experience), has everything on one page, specifies how to prep each ingredient clearly (ie grated cheese), specifies type of ingredient (ie whole milk), and turned out just fine. I definitely recommend it, although I couldn’t find potato buns here so I used regular white bread buns and it turned out perfectly fine. I also skipped the pickle garnish since decent dill pickles are very hard to find in the UK. Oh and one quibble: it says to drizzle the bread with olive oil in the instructions but olive oil isn’t listed in the ingredients. Books should not assume every cook has that at hand. 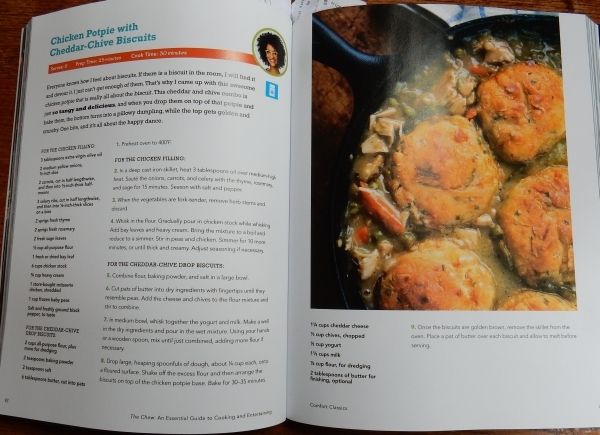 From the cookbook "The Chew", reprinted with permission as part of a review. Preheat the oven to 375°F. Spray a 13x9-inch baking dish with cooking spray. 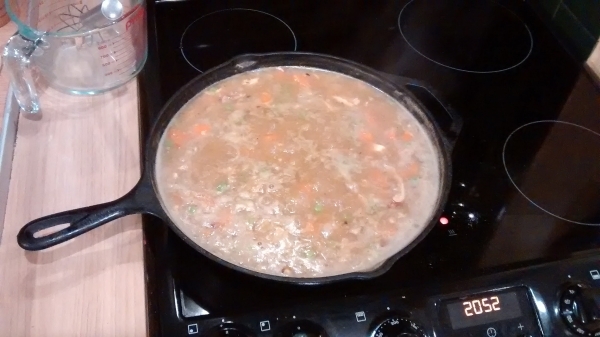 In the meantime, in a large saute pan over medium-high heat, add bacon. Cook until crispy, stirring occasionally, about 5 minutes. Remove to a paper towel-lined plate and set aside. To the same pan, add the ground beef. Cook, breaking up the meat with the back of a spoon, about 5 minutes or until meat is browned. Add the red onion and cook an additional 3 minutes, until the onions begin to soften. Add the bacon. Pour the meat mixture over the toasted bread. Toss to combine. Add half of the bread and meat mixture to the prepared pan. Sprinkle 1½ cups of shredded cheese evenly over the top. Add the other half of the bread and meat mixture to the top. Top with remaining 1 cup of shredded cheese. Bake, uncovered, for 30-35 minutes until golden brown. Remove from the oven and allow to set for 10 minutes for serving. Garnish with pickles on top. So after all of that, is this a cookbook worth buying? If you love this show and would like to read profiles of the hosts, tips on entertaining in your own home, and other fun tidbits, this is a good book for you. But if you’re more into straight cookbooks, don’t watch the show, or are a beginner cook and need things explained carefully to you, I’d say this book probably isn’t for you, especially since many of the recipes appear on the website anyway. 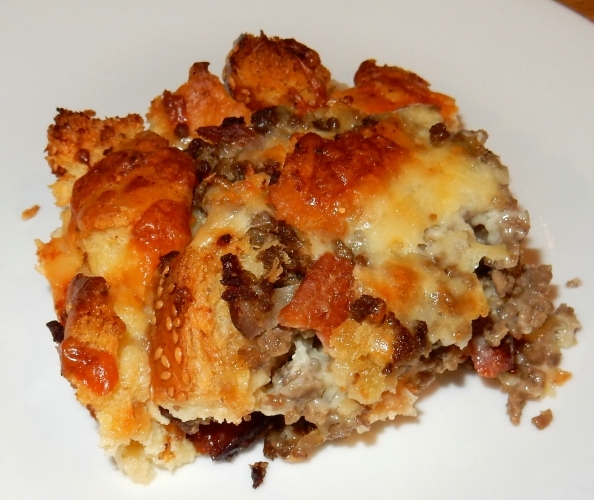 In fact I could have saved myself some time by just linking to the Burger Bread Pudding recipe on the site, but figured it was worth reprinting just in case the site takes it down. I can’t help but notice the website includes a helpful tip to bring the refrigerated version up to room temperature first, something not mentioned in the book. Also, the chicken pot pie recipe does not appear to be on the website at all. Overall I wouldn’t buy this book unless I was getting it as a gift for a real fan of the show. It needs refinement as a proper cookbook, and appears to be more of a show book than anything else. But if you know a fan of this show, they’ll probably eat the whole thing up. This entry was posted in Book Reviews, Dinner, Main Dishes, Other Food, Products. Bookmark the permalink. Thank you for reviewing this cookbook, and saving me money. Thanks for not only reading, but going through the pain and anguish of cooking a couple recipes. I have books that contains cross-outs and margin notes, but primarily to fit my family's tastes (or quantity for 5 kids plus parents). I don't think I would keep a book that is that difficult to use. Where does the bacon go? It's never mentioned again after setting aside. D'oh! Now that you mention it, I actually did notice that when actually cooking and mentioned it to Corran, but forgot by the time I blogged it here. Annnnd it looks like the web version also has that step missing. It just goes to "the meat mixture" but never actually tells you to add the bacon. Let me go update the article, and good catch! There, updated and added it in where I assume it should be in the recipe.